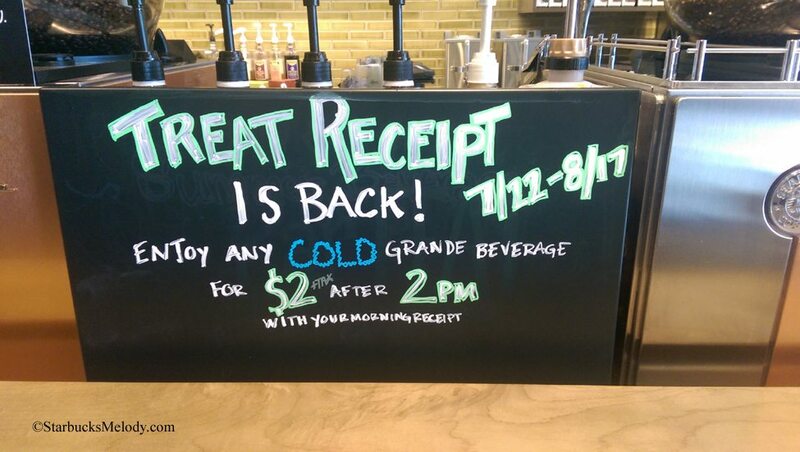 The Starbucks Treat Receipt Returns: July 22nd through August 17th. The annual Starbucks treat receipt returns, starting today. The way the treat receipt works is that you go to Starbucks before noon, hang on to your morning receipt, and then return the same afternoon and get a Grande-size cold/ iced beverage for $2.00. 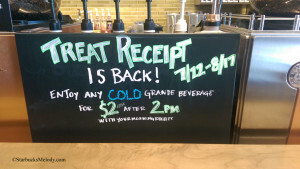 The “Treat Receipt” was first introduced as a summer promotion, August 2008 in response to MyStarbucksIdea.com feedback that customers wanted more value. It’s returned to Starbucks every summer since then. Do you really have to hang onto your receipt from that morning to take advantage of the treat receipt? Yes, you must present a receipt from earlier in the day. Does it matter what you purchase in the morning? No, any purchase works. Do I have to return to the exact same store where I got the morning treat receipt? You can go to any participating Starbucks in the afternoon. It doesn’t have to be the same one as your morning Starbucks visit. Do all stores participate? At a minimum, all company-operated Starbucks locations will be participating. It’s possible that not all licensed locations will be participating in this treat receipt promotion. Is there a treat receipt in Canada? Yes. However, I believe the Starbucks Canada treat receipt promotion dates are July 14th through August 10th. Can I get a Frappuccino with my treat receipt? Sure! Any cold beverage. Grande Iced Clover beverages, as well as the Starbucks smoothies, are also included. There’s one more promotion that I want to tell you about: 20% off packaged coffee in Starbucks stores, July 24th through July 30th. This promotion is only open to MyStarbucksRewards members. You don’t have to be any particular level of MyStarbucksRewards: Welcome, Green, and Gold Levels all can participate. You must pay for your purchase using a Starbucks card (or registered Teavana or Evolution Fresh cards, which are also Starbucks cards). This promo limits you to only two Starbucks packaged coffee items during the promotional period, and no more than one item per transaction. In other words, if a customer buy 3 pounds of Verona in one transaction, only one item would be 20% off. If a customer purchases three pounds of Verona at three different times, only two items will be 20% off, and all other packaged coffee items will be full price. Customers can use this perk for things like Verismo pods, whole bean coffees, K-Cups, and Starbucks Via Ready Brew coffee. Be on the look out for new Barista Promise Starbucks cups. I always like this. Do not know: does this apply to an iced Clover??? I never have used this promotion because I really do not save any money on my drink. Oh well! @Denise – I’m going to find out. Good question. Though I just emailed my SSC contact person and she has her out-of-office automatic reply thing on. I’ll find out when I can. I just used my card to pay for my drink this morning, and forgot to ask for my receipt. It shows on my starbucks mobile app that I got something today. Will that work if I show them that later for the $2 drink? @Kristy – I think you actually have to physically have the receipt, but I’ll find out as soon as I can, so you know for future reference. My official Starbucks spokesperson contact person is out of the office. Thanks for writing this blog, I love that it helps remind customers and also clarifies the treat receipt procedures! @Denise – the treat receipt is good for any grande cold beverage and even though I don’t have a clover in my store I would say yes! @Kristy – If you came to my store and showed me your morning purchase, I would accommodate you for your afternoon two dollar beverage, as I hope most stores would do! My sympathies go out to the Baristas who have to deal with the “entitled” customers that still fail understand the rules of the Treat Receipt or Coffee Promo. Now from the customer side, the Baristas should be giving receipts with every order during these promos. Sure you Baristas are gun shy because of the PITA customer who complains when you give them a receipt. Just smile (grrrr). IIRC, when it is “Treat Receipt” time the registers are programed to automatically produce a receipt up to 1:59p.m..
@DadCooks – i’ve seen a trend. In your post, and many others. It’s pretty cool these days to hate on customers and call them “entitled” and so on. I’ve seen plenty of honest misunderstanding at the register. I’ve seen confused baristas who weren’t knowledgeable enough to give solid answers to customer questions. I’ve seen customers who clearly look like they never go to Starbucks, stand baffled at the menu and really confused by what to order. If you didn’t go to Starbucks very often, and you just now heard about this thing called a “treat receipt” and so you ran into to take advantage of it, it would be confusing. There is this thing called honest misunderstanding. It’s real. Confusion and misunderstanding happen at the register all the time. I wouldn’t assume negative intent on either side of the register. Yes! The Treat Receipt is one of my favorite Starbucks promotions. I’m not usually a twice-a-day (nor a daily) customer, but during this promotion period, I do find myself frequenting my local store more often. A simple cup of brewed coffee or an Americano in the A.M. and a Frappuccino or Iced Macchiato in the evening. I would like to know if the smoothies are considered as cold beverages that can be purchased for $2 after 2pm in “treat receipt” promotion? @Melody:Have you receive the bonus Stars after 2:00 PM EM@il Promo? By what time do I have to make my first purchase? Noon? @jules: For most stores any time before 2:00 PM, but some Licensed Stores 11:59 AM Cut off. I browsed the #TreatReceipt on twitter; official SBUX account mentioned you can flash your in-app receipt! Though not as fun as the auto-stamped paper receipt (I’m a stickler for per diem accountable receipts). Hope this helps! @Melody: thanx for trying to find out re: Clover iced treat receipt. And yes, I feel, and seldom see, the partners offering up the receipts. This is certainly the one time it should be done, and possibly explained, especially since no signage! @Melody: Let me know if you hear re the iced Clover. Of course, I can ask at Sbux myself but might depend on which store I went to, depending on what I felt like I might want. @Denise – The official answer is “yes” you can get an iced grande Clover for $2 with a treat receipt. … this popped up when I looked up treat receipt to fins out if you could go to different location for afternoon $2 treat. As usual, you had the answer and also answered an email quickly when I asked how to subscribe to your posts – thanks! … and there is my answer – notify me of new posts by email – thanks! How does the receipt work when you order more than one drink in the morning? Do the baristas print a receipt for each drink or do they only print out one receipt? If it is all on one receipt, do we get to get as many drinks as we ordered in the morning? For what it’s worth, I was just noticing on the official email I received about the packaged coffee deal says it’s July 24-July 27. (wondering out loud) Why are sbux promotions so complex? I’m actually excited about this promotion, I wanted to try the Ethiopia coffee, definitely sweetens the deal. I almost always order vente drinks. Can the treat receipt be used for a discount on the vente? I was just told by a barista that I had to use my treat receipt before 7:00 pm is this true? No, you can use it until closing time. I’ve used this many times. Today had me wondering…. if there was some part of starbucks training not to give out receipts during this promotion. The last few days the baristas where I frequent have not been handing them to me even during three separate transactions during the day. I watched today as the hour progressed that not one person got a receipt. It does make me wonder if the manager is encouraging this practice to save money or if the employee is just being lazy to save himself work during the course of the day. Confused. Today I purchased something in SB AFTER 2pm, the bottom of the receipt still shows “TREAT RECEIPT IS BACK!”. Can I still come back later to SB and enjoy a $2 cold drink? Will the barista even check the date/time on the receipt? @Christine, you will only get one receipt & then one drink for the treat receipt. If you want multiple receipts, you will have to order each drink separately.